Thousands marched through Addis Ababa, Ethiopia, on Sunday to mourn the 157 people who died aboard Ethiopian Airlines flight 302 on March 10. 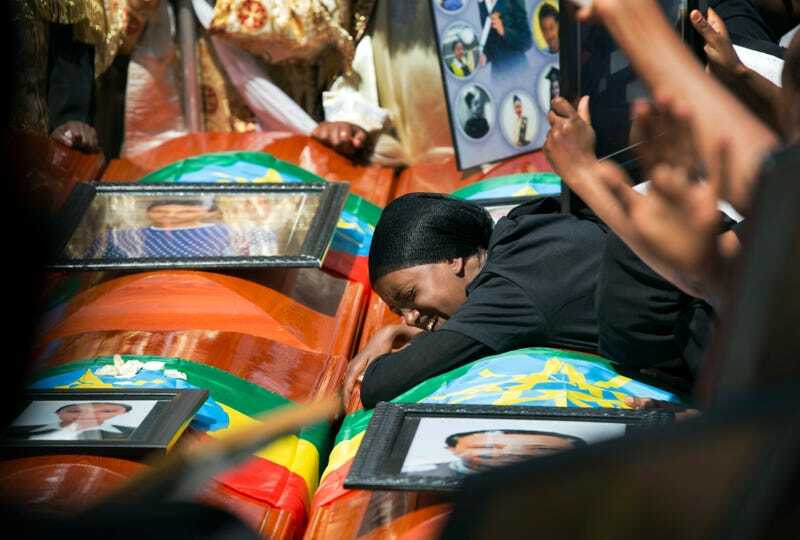 As part of the mass funeral ceremony, 17 empty caskets draped with the Ethiopian flag made their way to Holy Trinity Cathedral in the nation’s capital, the Associated Press reports. Mourners held photographs of loved ones who died in the crash, the cause of which is still being investigated. According to the AP, officials began delivering “bags of scorched earth” from the crash site to the victims’ families members on Saturday because of the challenges with identifying the passengers’ remains. That process could take anywhere from several weeks up to six months, officials say. Passengers from 35 countries, including Kenya, Canada, Ethiopia, France, the U.S., China, and Italy died aboard the flight. Many of the people onboard were humanitarian workers en route to Nairobi. Hours after the funeral, Ethiopian Transport Minister Dagmawit Moges told reporters the plane’s data recorder showed “clear similarities” between the Ethiopian Airlines disaster and another crash in Indonesia in October of last year, which killed all 189 people onboard. Both involved the same Boeing aircraft, the 737 Max 8 jetliner. As NPR’s All Things Considered reports, the similarities involve an anti-stall system on both jets. Satellite-based tracking data from the U.S. Federal Aviation Administration reportedly showed similar movements between the Flight 302 and Lion Air Flight 610: flying with “erratic altitude changes that could indicate the pilots struggled to control the aircraft,” the AP writes. In both instances, flight crews tried to return to their respective airports before crashing. Investigators are looking into whether new software involving their flight safety system played a role in the crash. According to a November report from the Wall Street Journal after the Lion Air crash, the possible fault could involve an autopilot feature that was designed to keep pilots from raising a plane’s nose too high, but instead pushes it down so “unexpectedly and so strongly” that pilots can’t pull the plane back up, even when switching to flying manually. Governments around the world have grounded the Boeing 737 Max planes following the crash in Ethiopia.